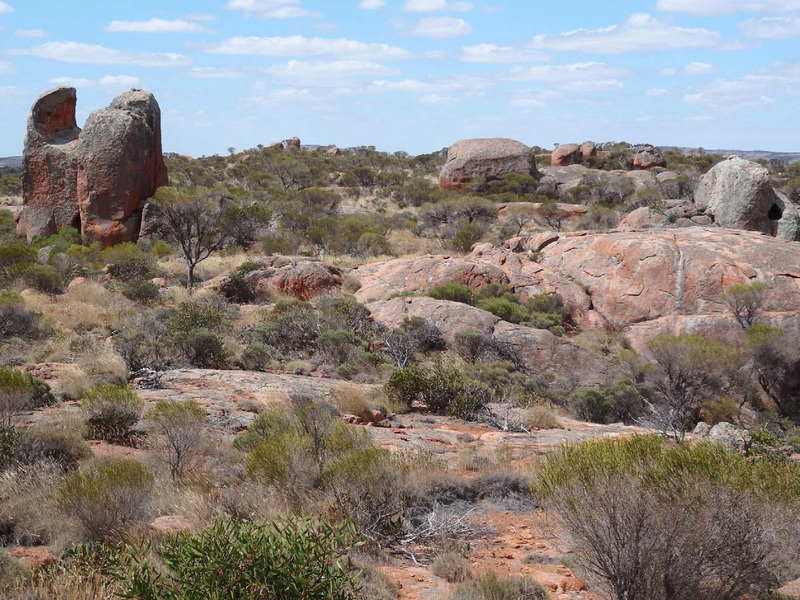 In November 2012, five staff members of the State Herbarium of South Australia participated in a two week survey on Hiltaba Station and Gawler Ranges National Park. These staff collected vascular plants and cryptogams as part of the Bush Blitz program. Lang, P.J., Kellermann, J., Bell, G.H. & Cross, H.B. (2013). Flora survey on Hiltaba Station and Gawler Ranges National Park: vascular plants, macrofungi, lichens, and bryophytes. Report for Bush Blitz, Australian Biological Resources Study, Canberra. (Department of Environment, Water and Natural Resources, South Australia: Adelaide). — 5.9mb PDF. Area of outcropping granite dominated by the Gawler Ranges endemic shrub Grevillea parallelinervis and by Melaleuca uncinata and Triodia irritans; hill NW of Mt Hiltaba, Hiltaba Station. Photo: J. Kellermann. Bush Blitz (2015). Hiltaba Nature Reserve and Gawler Ranges National Park SA 2012: a Bush Blitz survey report. (Australian Biological Resources Study: Canberra). — 5.8mb PDF. 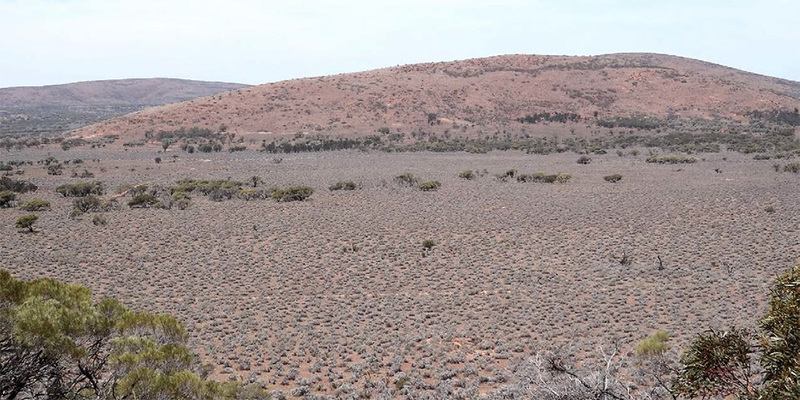 The primary survey effort was focussed on Hiltaba Station, which had been recently acquired by Nature Foundation SA, and records were made at 134 sites. Across the two properties the survey resulted in the collection of 782 plant specimens, plus a further 524 plant sighting records. The collections were supplemented by 136 vascular plant tissue samples collected in silica gel desiccant for future DNA analysis. A total of 88 plant taxa were newly recorded for the Hiltaba Nature Foundation property during the 2012 Bush Blitz Survey. This comprised 36 vascular plant taxa and 52 cryptogams (26 bryophytes, 22 lichens, and 4 macrofungi). In the Gawler Ranges National Park, 21 plant taxa were recorded for the first time, comprising 12 vascular plant taxa and 9 cryptogams. These surveys have made a significant contribution to our knowledge of the flora on both properties. Extensive area of intact Maireana sedifolia (Pearl Bluebush) Low Shrubland on open plain SW of Peeweena Bore, Hiltaba Station. Photo: P.J. Lang. The results of the survey and the problems encountered when revising and compiling flora lists were discussed in a presentation at the Bush Blitz Symposium in July 2013 (Old Parliament House, Canberra). Recordings of all presentations from the Symposium are available online. Kellermann, J., Lang, P.J. & Waycott, M. (2013). To the hilt: tackling flora lists for Hiltaba Station and Gawler Ranges National Park. — Recorded presentation (15 mins) by Jürgen Kellermann. Press releases by our colleagues from the South Australian Museum from 8 Nov. and 29 Nov. 2012. This entry was posted in News, Publications on 25 November, 2016 by Jürgen.